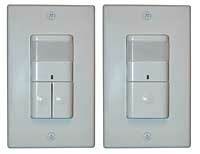 Square D wall-switch single- and dual-circuit occupancy sensors use both passive infrared and light-level sensor technologies. Both single- and dual-circuit occupancy sensors do not require a neutral connection or minimum load and use existing wiring. Both feature a 180-degree field of view, while achieving 300-square-foot minor motion coverage. Selectable Auto On and Manual On modes allow the sensors to be tailored to the specific needs of any application. The dual-circuit occupancy sensor independently controls two lighting circuits in spaces where bi-level control is required. Also available on the dual-circuit model is a lamp-saver mode that automatically alternates which circuit responds to motion in bi-level lighting applications. Both models are available in white, ivory, gray, light almond and black, with a color-matching lens.